Not much to write about today. Alexis is doing about the same as yesterday.. still laying around and not eating much (who am I kidding-- hardly anything at all!) and I am having to force her to drink. Not sure what her deal is really... hoping she gets out of this funk asap. 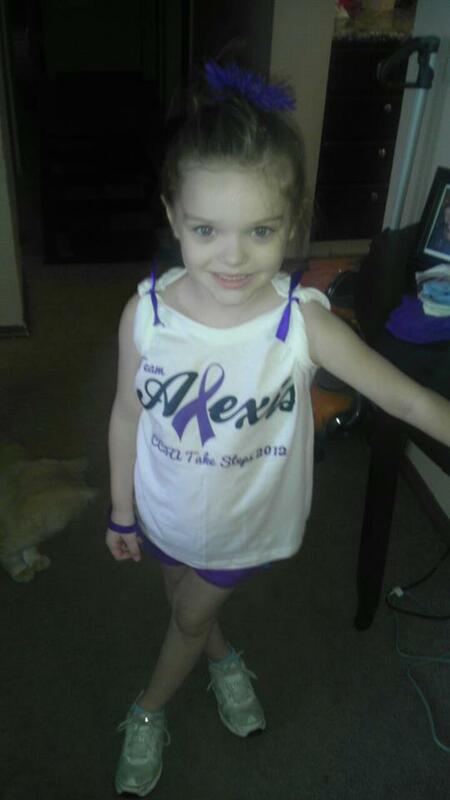 Alexis all ready for the CCFA 2012 walk! We encountered our first leak today. Not to bad at all, but I wasn't expecting to have to change her entire appliance after (almost) 3 days. I am going to try and get her used to wearing the ostomy belt, as I know that can improve the amount of time between bag changes. I was definetly more comfortable and relaxed changing the wafer, cutting it to size etc etc.. this time around vs. during the teaching at the hospital. However, I am kind of worried I cut the wafer just a tad too big. I know this is a learning experience for the both of us, and I am hoping I can perfect it sooner rather than later. I am on the hunt for a band for her to wear to cover the bag (think of a belly band--very similar). It will hold the bag closer to her body, thus being more secured and it will cover it under her shirts (since most of her shirts are form fitting). They make special ones for individuals with ostomys that you can tuck into a pocket, and I am not having any luck finding them in her size. We ventured out to the grocery store today and she was concerned about other people seeing it, so I want to get one as soon as I can, especially with school starting in a little over a month for her. Still no pathology report on Alexis' colon. I am getting a little antsy. I hope it doesn't mean anything bad. For once, I hope we have good news and they find no indication of Crohns whatsoever. Prayers that she is healed of this disease for good! Anyway, what I wanted to tell you about from our experience is this: Do everything you can to focus on any positive aspect that you can find, and avoid thinking about the negative things as much as you can. It might sound silly, but your state of mind is the most important thing of all. It is hard to see the good in any of these negative experiences. Frankie thought he had "bad luck." But some good things came out of it - he met his hero, felt love and support from people he didn't even know, even got gifts from them, and learned a lot from wonderful doctors & nurses - Looking back, he says that as hard as it was to go through it made him into the person he is today. He says he has "extreme" luck. Sometimes bad, but sometimes really really good. He is happy, strong and sensible, because of what he went through. I really believe in the power of prayer, so I'll be praying for your little Alexis, just like so many people prayed for my Frankie. Don't forget to take care of yourself and your husband sometimes, and enjoy Alexis and her little sister as much as you can while they are little. And stay positive. Stealth Belt can make custom sizes!!!! With custom fabrics too!